If you’re looking for a highly accurate measurement instrument that uses the latest technology, then the CM-3700A bench-top spectrophotometer is just what you need, and it exceeds most industry color requirements. With a wide range of applications, the CM-3700A obtains highly-accurate reflectance and transmittance measurements. 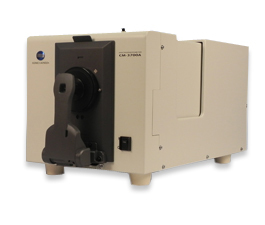 The CM-3700A spectrophotometer provides the highest level in accuracy and reliability available in a bench top unit. It features aperture masks, a large sphere, and a complete optical system, going above and beyond international standard requirements. Emitting a high power xenon flash when a measurement takes place, this instrument ensures the most accurate measurement is taken. Users are able to switch the size of the measurement area by choosing from 25.4mm, 8mm, and 3x5mm depending on the needs of their application. 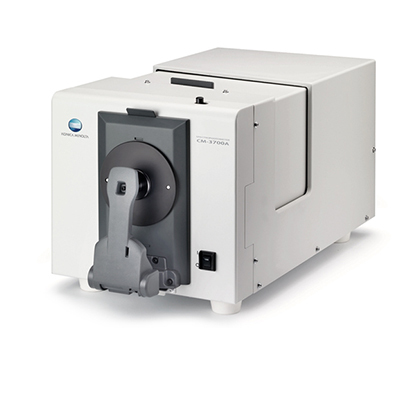 With a sample holder that also features a long arm to enable measuring the center of an A4-sized sample, the CM-3700A spectrophotometer also has a damper to provide a “slow-close” effect that prevents the sample holder from slamming shut which could possibly damage the measurement sample. With the ability to switch between SCI and SCE, the CM-3700A spectrophotometer makes measuring reflective colors easy. It’s also easy to determine florescent colors thanks to the instrument’s UV cut filters which allow 1,000-step adjustment of UV light, providing ideal measurement of pulp, paper, and any other materials containing florescent materials. Also, users can effectively measure transparent colors with diffused lighting. These unique features allow a wide range of applications to be measured including textiles, plastics, kiln-fired materials, dyed items, food, liquids, and others. The CM-3700A spectrophotometer is easily controllable by a PC via a USB cord, which provides an easier connection and faster communication. What’s more, data control and editing is easy with Windows compatibility. The CM-3700A’s compatibility with SpectraMagic NX software offers another easy-to-use option, and provides multiple views of data results which can then be edited. By associating two or more secondary targets with target data of the primary target, allows for sophisticated QC applications, such as checking for color difference. With the software’s easy drag-and-drop ability, information can be easily interpreted after printing. Preconfigured templates and a variety of graphs are available to display information, and information is available at a glance in the status window. Older data is compatible simply by transferring data compiled with older software to the newest updated software. Information can also be easily exported into Excel if that’s what you need to show data. Additional information is available with the Color Tutorial and the Navigation Function with the included software. Conforms to CIE No.15, lSO 7724/1, ASTM E 1164, DIN 5033 Teil 7 and JIS Z 8722 condition c standard. Conforms to CIE No.15, ASTM E 1164, DIN 5033 Teil 7 and JIS Z 8722 condition g standard. Sample holder (optional) for holding sheet samples or containers of liquid samples can be installed/removed.